San Antonio, Texas saw it's median house price grow by 3% this year compared to last December with a median price for single family homes sold at around 227K. The average days on market remained the same as last year at 64 days. 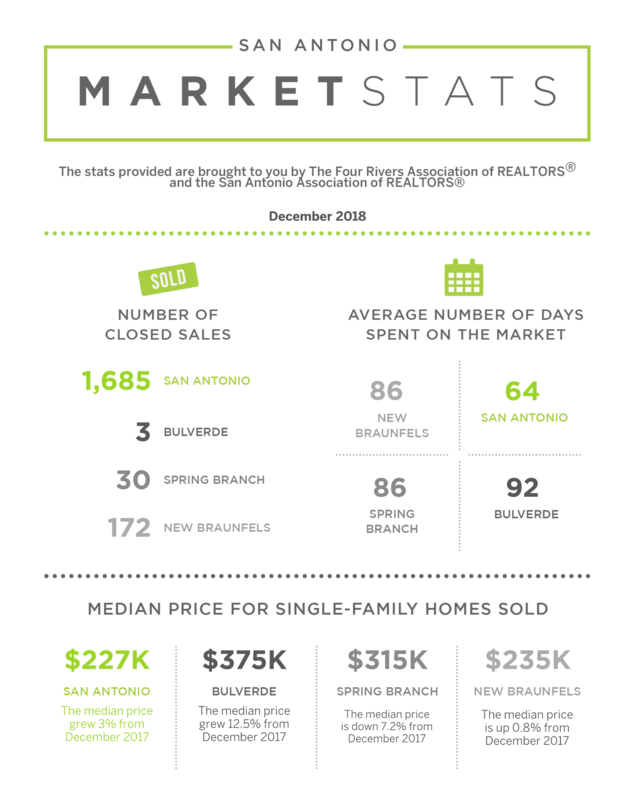 In Bulverde, the market appeared to slow in December. Median price was up 12.5% this December compared to December 2017. Average days on market were down on average around 10 days. The overall number of closed sales was small and was 50% less than last year. Spring Branch saw some decrease in price this December, as home median price was down but the number of closed sales rose. With the average home on market 86 days, almost 30 days less than last December, and closed sales up by 15%. The number of listings could be a contributing factor to the drop in price. Median price rose 0.8% in New Braunfels however closed sales were up 14.7%. With average days on market around at 86 which is only 5 days less than last year. The biggest news is the number of active listings that were up by 26.8% to a total of 549 as of December 2018.